At the workshops I ran recently at the Guild, I demonstrated black bean dyeing. It’s a cold process that takes some days, so it isn’t possible to complete it during a workshop. 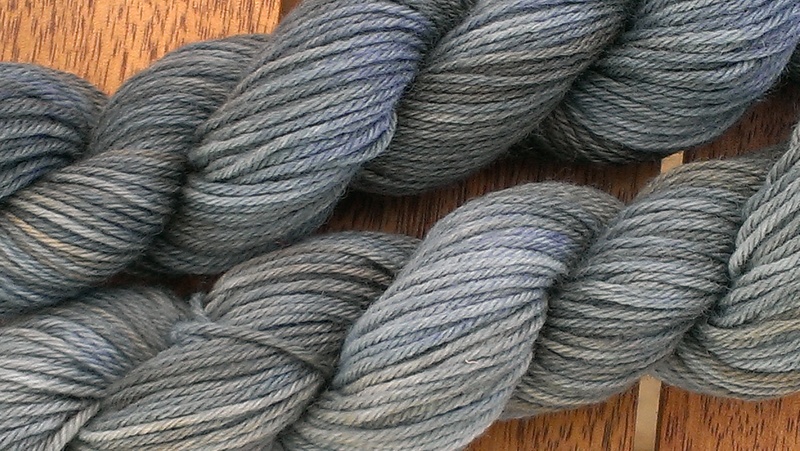 I had pre-mordanted my fibres in alum and chosen some 25g skeins of patonyle I acquired at a garage sale. This is a superwash wool/nylon blend that is designed for socks. It started out a cream colour rather than absolutely white. The first workshop took place during a hot period. It was 36C on the day and I was longing to have enough space for a bucket of beans in the fridge. Travelling home with them in my car was not as sweet smelling as a person might like. 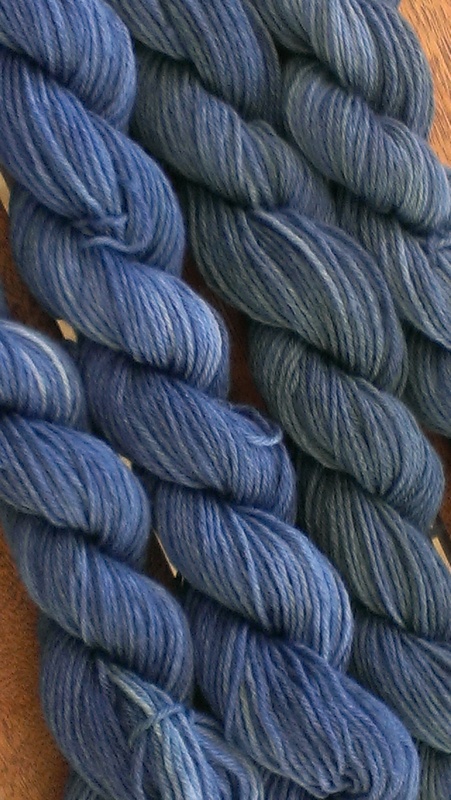 The resulting colour wasn’t at the high end of blues I have previously achieved with black beans, either. For the second workshop, I used a different pack of beans from a different source, and when I looked at the bag, which said ‘1 kg black eyed beans, $3.40’–clearly inaccurate on the naming front–I couldn’t even remember where I found them. Quite likely in an Asian grocery rather than a supermarket chain, looking at the label. They had been packaged by someone who wasn’t working in a gigantic factory. I travelled home from the second workshop with soymilk and black beans in the front seat of the car. The black bean colour was so lovely and so strong-looking by the evening of that day that I decided to throw the two skeins in the picture above in as well. I used 3 cups of beans (about half the pack) and tap water (as rain water had not imparted any special magic the first time). 100g sock yarn dyed for $1.70 with the option to remove the beans from the dye bath before putting the wool in and make them into dinner! My thanks to the geniuses who posted about their experiments online on Ravelry. I’ve heard online that this isn’t the most lightfast dye known to humankind but I’ve dyed and knit two sets of socks with black beans so far and they’re doing well. I figure socks don’t get a lot of exposure to light, and if they fade… I can cold dye them again to tune them up. I seriously need to try this. Thanks for sharing this! There is so much more information on Ravelry, where people are all contributing their experiments to the collective pool of wisdom. I hope you have success!